With Dungeon Boss an action RPG game app for Android, iPhone and iPad was released. This genre is very popular and many Apps were also already released, such as The Walking Dead: Road to Survival, which we presented recently here on mobilesector.net. However, the graphics on Dungeon Boss guided itself by fantasy games. Accordingly, there are units of different elements, such as nature or water. Again, you need a team of heroes, with which you go into the fights. After the first start of Dungeon Boss you are confronted with a tutorial. Here you will learn step by step the controls and the menus. But in the further progress you are then on your own. So you need to acquire additional heroes to upgrade them and put together the best possible team for the fights. However, Evos and additional units are necessary for the evolution of your heroes, which you can find randomly in the individual levels. If that takes too long, you can also easily grab jewels the premium currency from in-app purchase. Furthermore, the game time is limited, because each attack uses energy that can run out very fast. With each level up, however, a certain amount of energy is re-credited. In the fight itself you open chests, kill bosses and units to collect coins. With these coins you can upgrade your heroes, so that they cause more damage in Dungeon Boss. Each hero has a normal attack mode and a special ability. This Special Skill can however only be used every 5 rounds. AT level 10 your own dungeon will be unlocked, you have to defend it in the Dungeon Boss. At the same time, you can of course also attack the Dungeons other players. To be victorious in the Dungeon Boss app for Android and iOS, however, the right strategy is always important, because every hero has strengths and weaknesses, that you need to take advantage of. Fans of action RPG games should certainly be satisfied with Dungeon Boss . 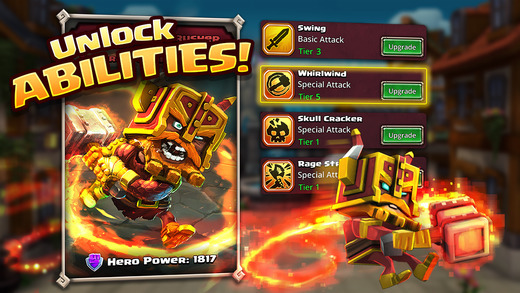 The level up, upgrade and collect new hero game, promises hours of fun. Different worlds are ready, where you have to defeat the Boss with the right strategy and well-equipped heroes . Later, it also possible to defend his dungeon against other players. In this way, you collect gold, which you need to further improve your units in Dungeon Boss. The graphic implementation is very well done. Only criticism is certainly the Free2Play gameplay. Who accesses the in-app purchases, can get more quickly better units and upgrade. Dungeon Boss is available for Android and iOS. In the iTunes App Store Dungeon Boss is available free of charge, financed is the game through in-app purchases. You can download the game for iPhone, iPad and iPod touch, at least iOS 7 must be installed. Visit the Big Fish Games Website for the latest informations about Dungeon Boss.